SharePoint Alternatives: What's the right intranet for your organization? If you're in the market for a digital workplace, chances are you've considered SharePoint. As Microsoft's answer to document management and web-based collaboration, SharePoint can seem like a sound choice - particularly if you're already invested in the Office 365 productivity suite. However, if you've done any research, you also know that SharePoint has received its share of bad press over the years. Variously described as the "Swiss Army Chainsaw" or "The most expensive free tool" - many organizations have fallen victim to the platform's sheer size, complexity, and cost of maintenance. According to an AIIM report, a whopping 40% of organizations consider their SharePoint solution to be unsuccessful. At the same time, there is no disputing the solution's extensive functionality and flexibility. How do you cut through the noise to determine if SharePoint is the right intranet or digital employee experience platform (DEX) for you? This post peels back the layers so you can see the differences between SharePoint and an alternative option like out-of-the-box intranet, GreenOrbit - you'll have all the information you need to make an informed choice. 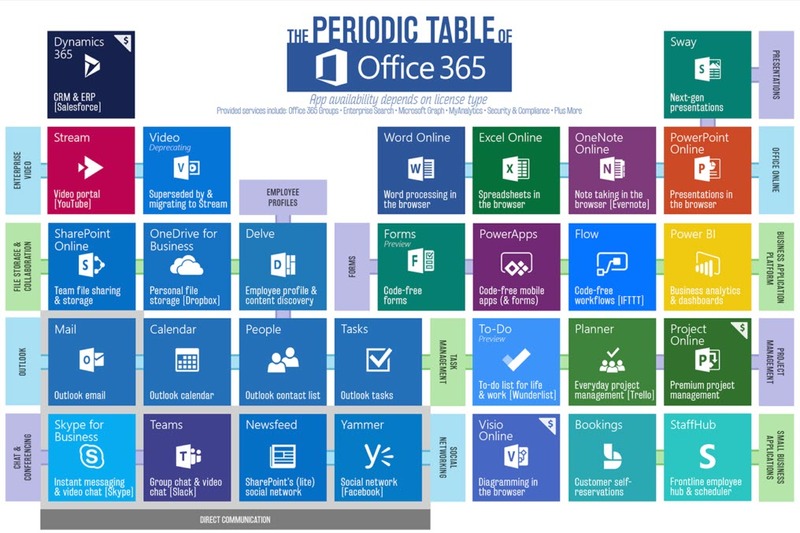 Since it comes "free" with enterprise level Office 365, many organizations default to using SharePoint as their intranet platform. In a sense, they don't choose SharePoint - it chooses them. On paper, the features look impressive, but the 'functionality' metric is not just about the number of features a solution has to offer - it's about whether the features are 'fit for purpose' and whether they succeed in meeting business needs without complex customization. For example, if you're looking for an intranet to drive communication and break down departmental silos - it can be difficult to see how to make this work in SharePoint. Which components address these organizational goals? What will it take to pull these components together into a cohesive experience? For most organizations, it takes a third party SharePoint consultant (and extensive customizations) to deliver effective answers to these questions. This might be fine for large enterprises - with IT departments that have SharePoint expertise and lots of spare capacity - but can prove prohibitively expensive for others. Will it drive better business outcomes? SharePoint didn't start life as an intranet, instead it's a mix of several platforms that have been acquired by Microsoft over the years - not exactly a great example of 'intentional design'. 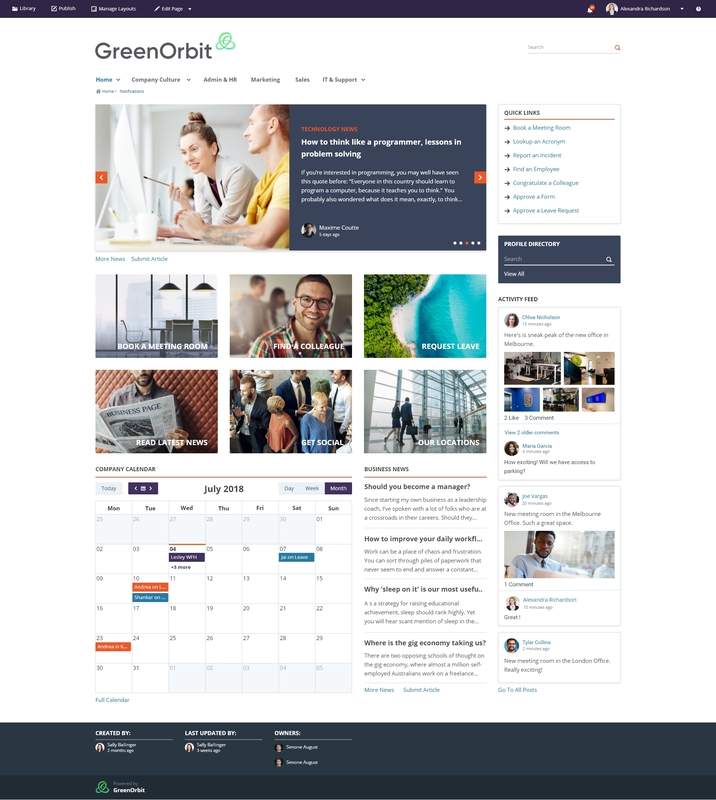 In contrast, GreenOrbit is a dedicated intranet solution - built from the ground up and honed over the years to address the core pillars of digital workplace experience; productivity, collaboration, content and culture. It's common for organizations to 'make do' with SharePoint - trying to shoehorn it into the broader business strategy. This can lead to problems with adoption and stakeholder buy-in. It can be a time-wasting step in the wrong direction. Make no mistake - SharePoint is feature-rich and highly flexible but, depending on the organization, it can be like giving a toddler the keys to a helicopter. Over the years, SharePoint has had a reputation for breaking or ignoring the rules around User Experience - lack of signposting, breadcrumbs and poor navigation are some of the themes that frequently bubble-up - particularly for those working in the classic SharePoint UI. Modern SharePoint has made some headway on this, but it has also created a headache for organizations looking to upgrade their highly customized classic SharePoint to the new Modern version. According to AIIM, close to 60% of organizations blame low adoption rates on the fact that the solution has a steep learning curve and is difficult to use. It also requires a level of expertise that makes it difficult for content creators in Internal Comms and HR to take an agile approach to information management. You might also find yourself frustrated by Sharepoint's fragmented approach to social collaboration - MySites and Newsfeeds are separate entities that require users to navigate away from the intranet. Sharepoint allows you to set multi-level permissions to govern who can do what in the intranet - but if approached without a plan, the results can become complicated and confusing. This is especially true if you create new custom permission groups. 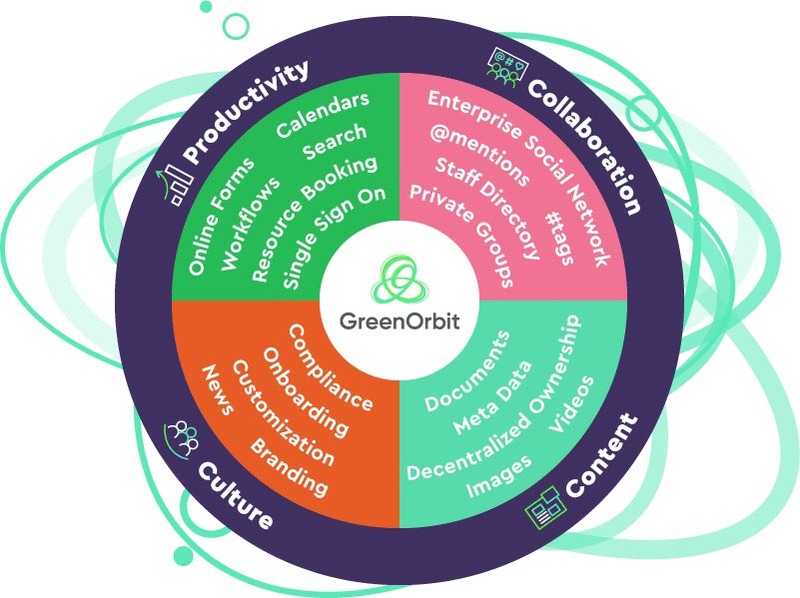 In GreenOrbit, there is a consistent and streamlined process for defining, viewing and editing the creation rights of every user and content item. It can also be difficult to control the proliferation of sites in a SharePoint intranet - and many users report feeling overwhelmed and out-of-control. For example, when you create a new Office 365 Group, you automatically create a new SharePoint site collection - without realizing it. It can be hard to get your head around what all these sites and site collections are about. Microsoft is obviously a trusted vendor - but when it comes to customizing the look and feel, setting up workflows and deploying your intranet, they take a hands-off approach. You'll need to hire a SharePoint consultant or build a team in-house - both of which come at a considerable cost. With a GreenOrbit subscription, you are not just buying the software - you're buying decades of intranet experience too. Based on your branding guidelines and the results of an in-depth Information Architecture review, UX experts will deliver a cohesive intranet that meets user needs and is branded to suit your organization's culture and objectives. They will take care of deployment and provide training. You won't need to hire specialized intranet consultants or lean on internal IT resources. Although organizations get a free SharePoint Online license with Office 365, the eventual outcome could easily cost more than $120k when you factor in customizations, third-party integrations, specialist consultants, internal resources and deployment. While it can take upwards of 12 months to deploy a SharePoint solution, your GreenOrbit intranet can be up and running in a matter of weeks - depending on your site's requirements. "...the days of large-scale SharePoint build-outs for collaboration and content management are probably over. Newer products are often just as flexible, relatively inexpensive and don't require .NET expertise for complex customizations." We could all use a crystal ball to see what's ahead - to make sure our digital workplaces are successful now and into the uncertain future. It seems likely that productivity, innovation and employee experience will continue to reign supreme as the hallmarks of a successful organization. If your intranet supports these pillars without breaking the bank or causing undue chaos - you made the right choice.